"This is Essential education for budding coaches" David Taylor ~ Head Coach at The Freedom Factory. Nathan Douglas ~ Olympic Triple Jumper said " I came on this course to receive an understanding of life coaching. I have been absolutely blown out of the water with how brilliant this course was and the skills it has given me. In was in depth and well rounded." This programme offers you practical and extensive training and coaching for a professional career with all the tools, techniques and skills to become a professional certified life and career coach. It also gives you strong leadership, relationship building skills and exceptional personal growth. We keep our class numbers small enabling maximum one to one tutor attention. There were three areas we to cover.  Managers wanting more skills to enhance their job and for promotion prospects as well as people in HR or EHM anyone who wants to lead their teams more effectively.  People who wanted to get greater self belief and confidence as well as exceptional communication skills so that they could get a good job or to believe that they could achieve what they wanted to. 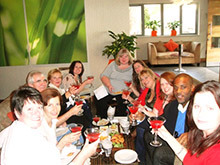  People who wanted to set up their own business and become Life and/or Executive coaches. You will come out of this practical, hands-on programme as a qualificated, professional coach with a strong grounding in all core coaching competencies and exceptional personal development and leadership growth. It also includes all aspects of developing a professional business along with a comprehensive coaching 'tool kit'. Our experienced coaches will share with you knowledge gained through years of successful practice and support you 100%. 5 day intensive coaching programme within companies to give your people a world wide recognised qualification and thorough grounding in all coaching skills. Your people will become exceptional team leaders, managers and coaches gaining the credibility and respect of having completed a professional indepth programme. This is a MUST DO for all HR and EHM as well as team leaders and managers. get in touch to find out the exceptional rates we offer you. The differences between coaching, mentoring, counselling and consulting. What underpins the purpose and effectiveness of coaching and examples of core coaching competencies. How to BE a great coach and how to establish rapid rapport by reading physiology. Coaching others and developing your own strong internal drivers and exploring boundaries and values. Techniques enabling you to quickly get to the source of your clients challenges and blocks including the SMARTI method of coaching to action. Create an extensive life coaching ‘tool kit' including questionnaires, proformas, developmental strategies and skills in listening and questionning. Learn how to get clarity and commitment to the stated goal. Understand how you can successfully coach in ANY sector. Learn the different cycles of the coaching process and how you can apply them to keep your coachees in action, learning and enjoying the coaching process and most importantly creating great results in their lives. Plan, do, review. How to build and guide teams, establishing joint purpose using flexible techniques and key transactional questioning. Use of NLP in coaching such as reframing, predicates, instant rapport building, audio, visual, kinaesthetic, gustatory, olfactory ways of communication and the psychology of coaching. Gives you insights, tools and techniques that will literally transform you and your clients, eliminating your own doubt and any negative beliefs so you can be more powerful and successful in your life and career. We explore the power of the subconscious mind to get huge internal shifts and external behaviour transformation and in the process you will gain massive interpersonal skills and confidence in yourself and your ability to coach others. How to develop your own successful practice, how to get paying clients and how to approach companies and individuals to create more business.The Kerslake Company Supervision document. For this last module we help you establish your action plan containing all essential steps for you to get started in your practice including a SWOT analysis. During this programme there are many opportunities to be coached by your peers, enabling you to do some fantastic inner developmental work and personal growth as well as practicing your new skills in a monitored environment. If you have a desire to learn ground breaking techniques, grow personally and professionally and help others be more successful in their personal and professional life, I strongly urge you to join us on our Professional Coaching Programme. Email me today. debs@thekerslakecompany.com for a registration form. Why choose The Kerslake Company's Coaching College? See our Frequently Asked Questions page for more information on the Professional Coaching Programme. Read our customer testimonials and meet our team. This course exceeded expectations on all levels from the perspective of individual performance management and for increasing knowledge. I found it to be very inspiring. Gemma Boucher HR professional. Thank you to you and the smashing team for a seriously fantastic course. The atmosphere was great, and I loved bonding with our group. We were VERY well managed, brilliant. I was thrilled with the coaching programme. What surprised me about the course was that I did an enormous amount of personal growth and consequently am more confident in my abilities than ever before. It's also helped me clarify where I want to be in my future regarding career and family. Very Inspirational, thank youl!! I would never have thought that it was possible to cover so much great material in such a short space of time, I found it to be very professional, inspirational and brilliant for my own personal growth. 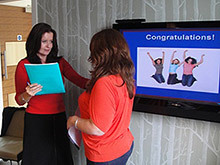 The trainers are exceptional, authentic, motivating and experienced, the modelled excellence. This programme is life changing, challenging and thought provoking. I loved the variety and the practical exercises, it was confidence building, affirming and thoroughly enjoyable. Every aspect of the course was useful. The whole programme and each instructor individually are truly inspirational and it has changed my life in more ways than one. A very rewarding and insightful programme, I would thoroughly recommend it. 'having been a psychotherapist for several years I was interested but skeptical about coaching; I found the Kerslake Company on-line and from my initial contact right through to qualifying was a very positive experience. Each of the trainers was very experienced and led sessions with a healthy mix of humanity and professionalism. I found all the trainers to be skilled in their unique and personal coaching styles and each exuding her own brand of competence and natural confidence. The training and the welcoming warmth creating by the Kerslake company had a powerful impact - I qualified feeling very motivated and sufficiently competent to apply my newly acquired coaching skills; I feel thoroughly trained and have been given great foundations to work from as a coach. I have had continued contact and support from the Kerslake Company long after qualifying, and my coaching work has continued to expand steadily'. It was truly a great experience for me - I'm really grateful.